Approximately $4.50 for 12oz at your local grocery. 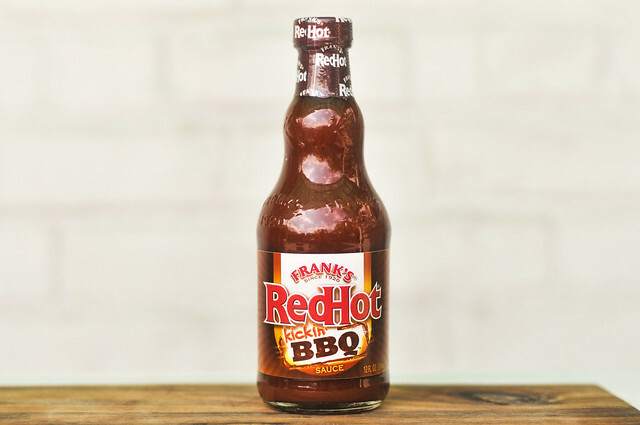 A sugary version of Frank's RedHot original sauce, this "barbecue" sauce is more likely leaving you wishing for the real deal than making delicious chicken or ribs. It's Superbowl time, and that means wings, and there's only one sauce for Buffalo wings in my opinion, Frank's! While my house is never without a bottle of their original RedHot sauce, I didn't even know Frank's had a barbecue sauce until Meatwaver Tyson tipped me off, confessing it's a guilty pleasure of his. So I went to my local grocery, and low-and-behold, on the shelf sitting next to the Frank's RedHot I'm so accustomed to was this "Kickin' BBQ" sauce. Along with the finding the barbecue sauce, I also did a little background research on Frank's. I knew that the sauce rose to notoriety after Teressa Bellissimo doused some fried wings in it at the Anchor Bar and Grill in Buffalo, New York in 1964. What I didn't know was the sauce actually dates back to 1918 when Jacob Frank, of the Frank Tea and Spice Company, partnered with Adam Estilette, a pepper farmer from New Iberia, Louisiana, and they worked together to create the aged cayenne pepper sauce that became Frank's RedHot. It hit the shelves two years later, and the rest is history. Today, Frank's continues to make its original its original sauce along with seven other varieties. With side-by-side comparison, the aroma is exactly what you'd expect from Frank's RedHot. There's a strong tangy cayenne smell that singes the nose, although this barbecue version is notable less intense. There's also a hint of sugary sweetness behind the hot sauce, but not much else pops out as a distinguishing factor from the original—it's a ubiquitous Buffalo wing smell. 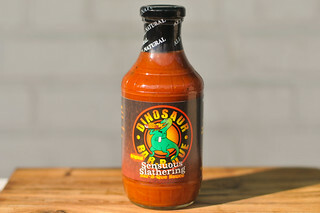 The color of this sauce borders between red and orange, with a slight neon tinge that defines the appearance of buffalo sauce. It sits right in the middle of the thickness scale and is incredibly smooth with virtual no spices visible. The sauce falls in a consistant steady stream from suspended spoon, with a few final drips as it slows, and a transparent coating left clinging. Frank's RedHot Kickin' BBQ has more in common with a scaled back wing sauce than a barbecue sauce, but I guess that's to be expected to some extent. There's a buttery flavor that features the cayenne and vinegar tang of Frank's upfront and center. 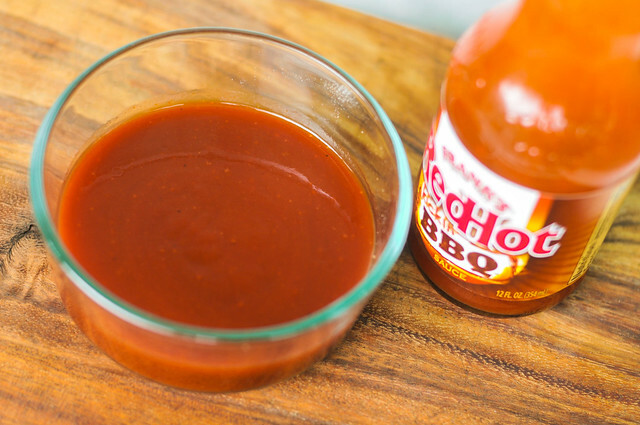 There's a slight sweetness to it, but the corn syrups and sugars do more to lessen the intensity of the hot sauce rather than make it taste like barbecue. The sauce coated and baked in well, and there was on slight caramelization over direct heat. After being cooked, the sauce did feel a bit more like a barbecue sauce. The sugars became more prominent and mixed with the vinegar for a sweet and tangy initial bite. As the sauce settled on the tongue, the flavor of Frank's become very apparent, although packing little punch compared to the original hot sauce. 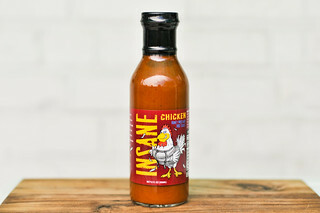 The cayenne burn only kicked in after subsequent bites of the chicken as the sauce built up on the lips and tongue. I understand Tyson's attraction to this "guilty pleasure," as the flavor of Frank's is nearly impossible to resist. That being said, it doesn't really live up to its label as a barbecue sauce. Out of the jar that sauce tasted like a scaled back version of the original Frank's, which left me wanting more heat to bring it in line with the flavor that I know and love. It did taste more barbecue sauce like after being cooked, with some sweetness starting off the flavor profile, followed by waves of vinegar tang and then peppery heat. Still, being Frank's, I found this inferior to the original and really just wanted that. 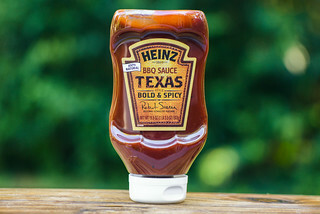 Maybe Frank's is too ingrained in my psyche as one thing—Buffalo wings—but it does that one thing so damn well that this barbecue sauce version just can't compete when it's more of sweetened version of the original than a good barbecue sauce. I haven't noticed that one on the shelves here. 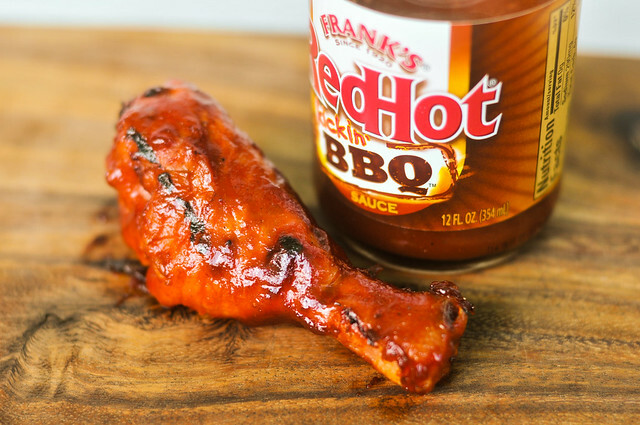 anyone know of a copycat recipe for Frank's picking barbecue wings sauce? I can't seem to find it anywhere.. and we love it! Where in Washington can we get this. We have looked everywhere for the BBQ Franks sauce. Would like to find a store that carry this. Try Amazon, we have been buying it there for a couple of years. A bit spendy but I just love the stuff. Excellent on chicken, pork, and beef. Not thick an heavy like bbq sauces, thinner like Frank's Red Hot Sauce.